The most ‘mystical’ place that I have ever visited in Japan is Bodai-ji in Mutsu City, Aomori Prefecture. 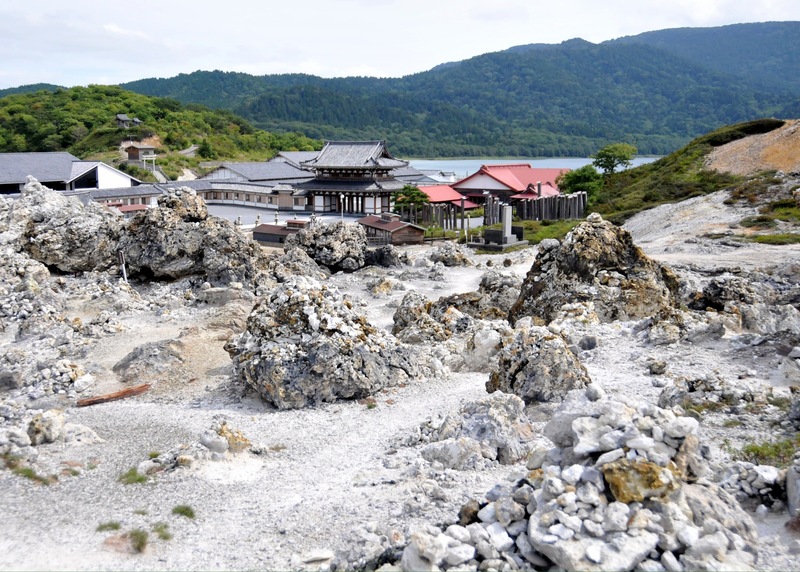 This temple sits beside a lake in the caldera of an eight-peaked volcanic mountain called Osorezan and is usually referred to by that name. 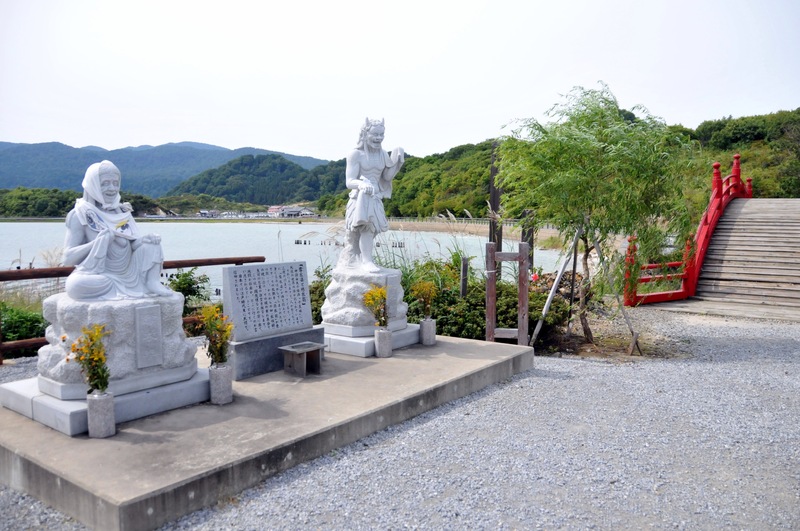 Osorezan was founded in 862 by the famous priest, Ennin, when he enshrined a statue of the bodhisattva Jizo there. It is believed to be a gate to the underworld and is one of the three most sacred mountains in Japan – with Kyoto/Shiga’s Hieizan and Wakayama’s Koyasan. 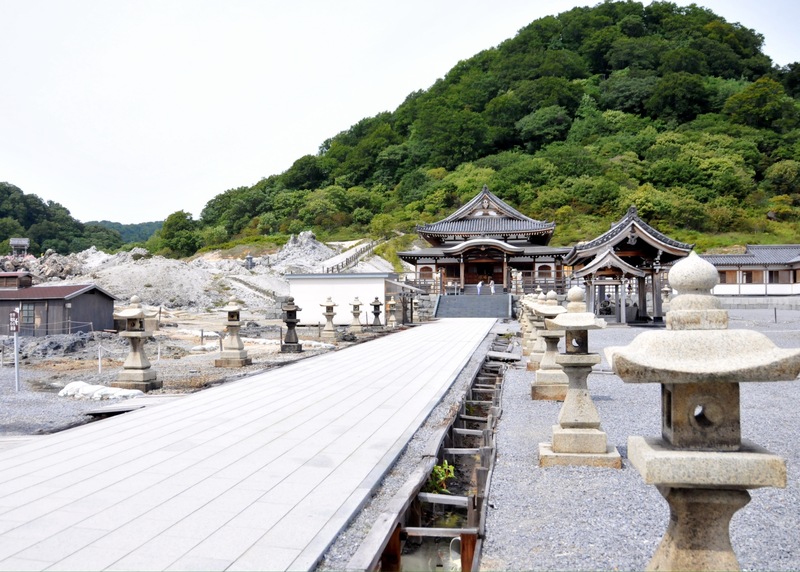 Many worshippers visit Osorezan to hold memorial services and it is the last of 33 temples on a local pilgrimage. Stunning scenery and an eerie atmosphere have also made the temple a popular tourist destination. 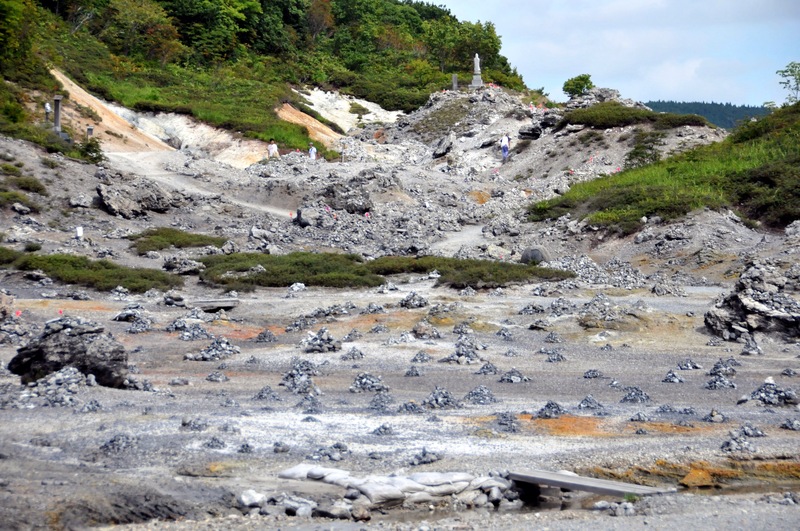 Although it has not erupted in over 10,000 years, Osorezan is considered an active volcano. Sulfurous gases emanate from the ground and the lake and river water is heavily acidic – causing it to be crystal clear and almost completely devoid of life. In addition, hot water gushes out of four springs. 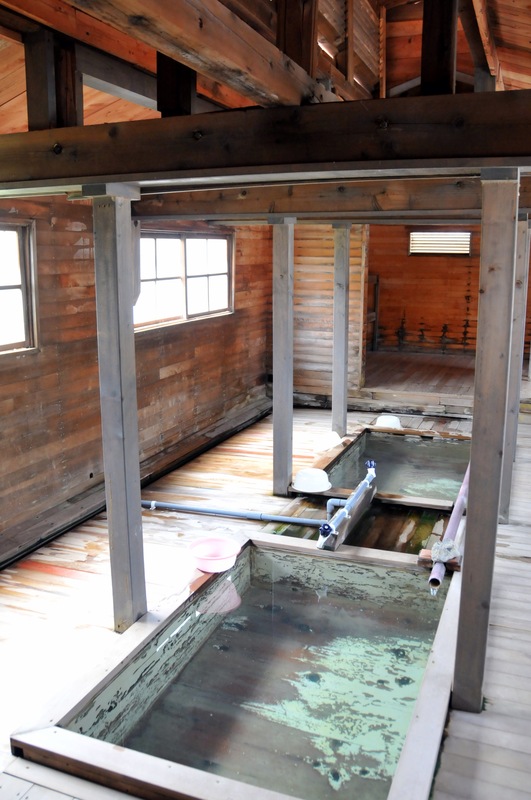 They fill indoor onsen baths that have been built within the temple grounds. Visitors are welcome to bathe in them free of charge. 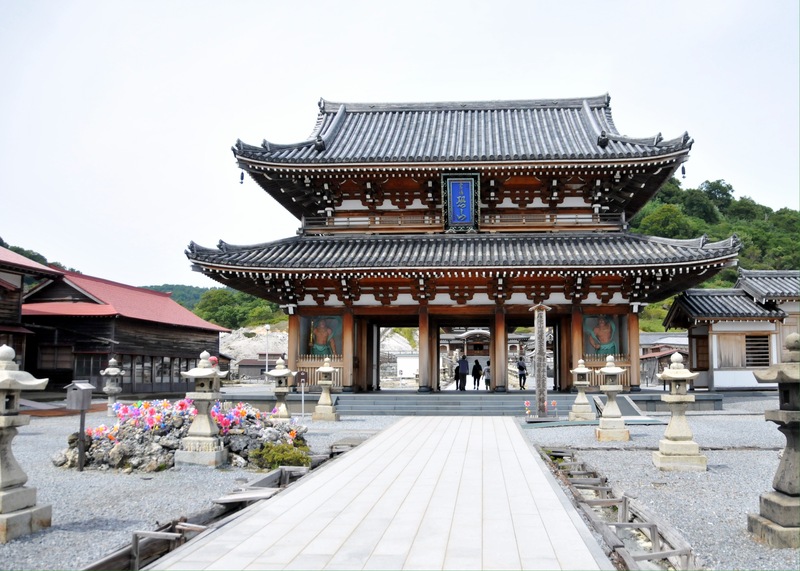 The temple has two annual festivals, the Osorezan Taisai (Grand Festival) on July 20-24 and the Osorezan Akimatsuri (Autumn Festival) which is always held on the long weekend in early October. 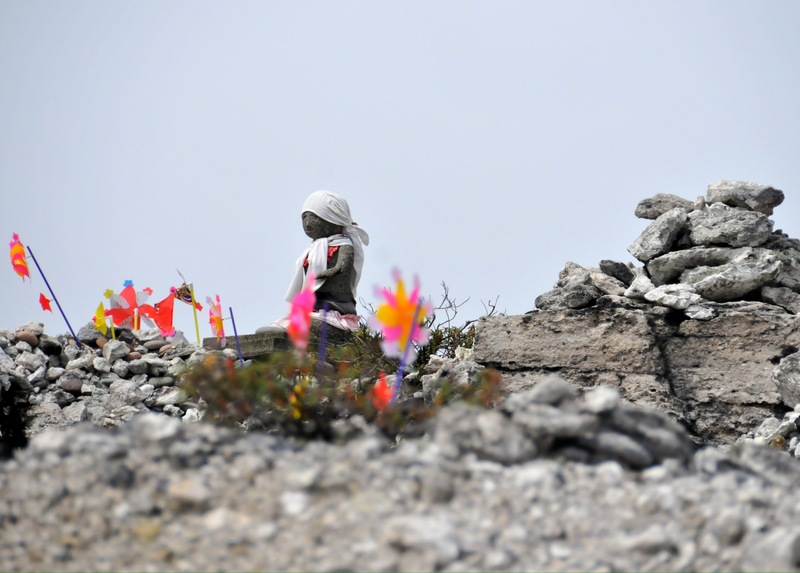 A major draw at these festivals are itako (female mediums) who gather to help pilgrims communicate with their deceased loved ones. 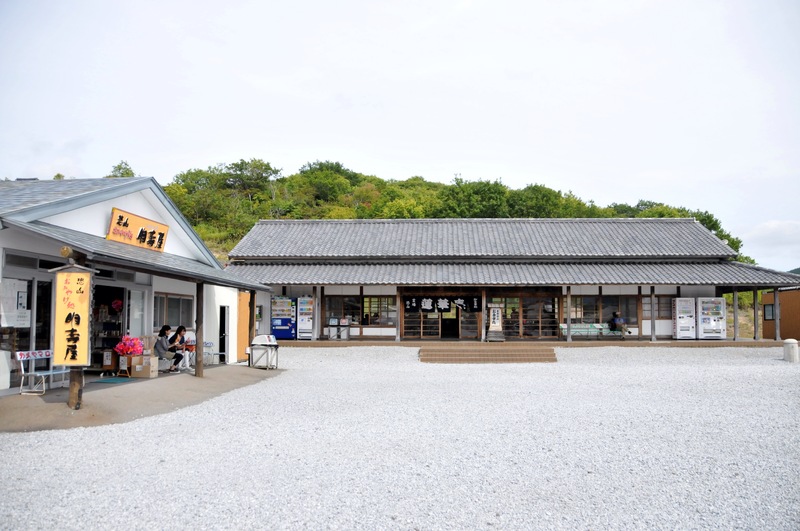 Although very crowded during the festivals, due to its remote location, Osorezan does not normally get many visitors. We were almost always alone and it was very quiet – except for a gaggle of giant Japanese crows who obviously reside nearby. Between the temple and the lake, sandy trails pass by steam vents, piles of stones, and a variety of religious monuments. 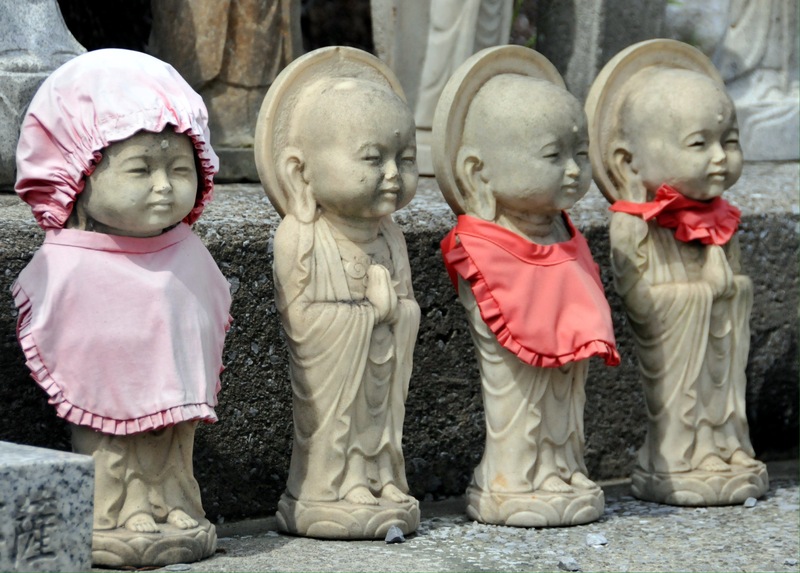 Due to its connection to Jizo, the guardian deity of children, pinwheels have been placed throughout the grounds to comfort the spirits of children who have died. 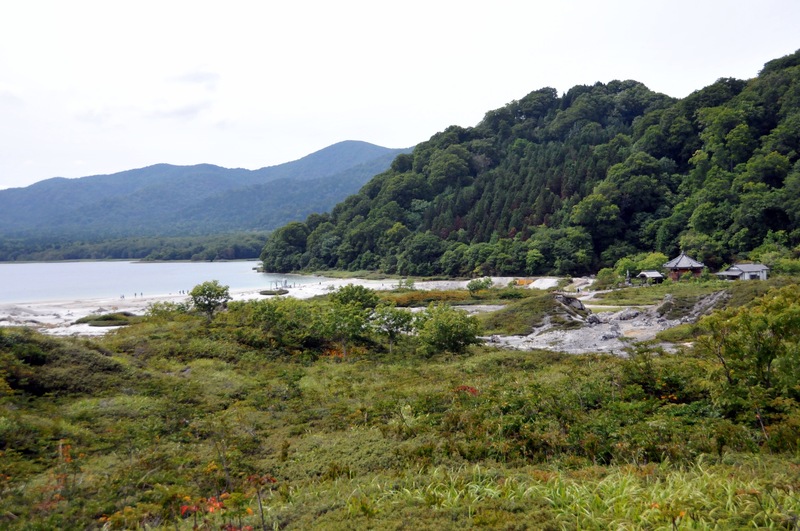 Although difficult to reach, Osorezan is one of Japan’s most fascinating destinations. The contrast between the temple’s mysterious atmosphere and the surrounding scenery is worth seeing. Give yourself a couple of hours to explore (more if you plan to soak in an onsen and/or have lunch). Osorezan is located in Aomori Prefecture near the center of the Shimokita Peninsula at the very northern tip of the island of Honshu. It is 30 minutes by car from JR Ominato Station or 45 minutes by bus from Shimokita Station (3-5 per day). We visited by car – after taking the ferry that connects Hakodate in Hokkaido and nearby Oma. Osorezan is open from 6am to 5pm, but is closed from November to April. The admission fee is 500 yen. There is a souvenir shop and restaurant on-site. If you book in advance, it is also possible to stay overnight in the temple’s excellent lodging. *If you visit, remember this is one of Japan’s most sacred locations. Be respectful and, even in the the wide open spaces, do not speak using a loud voice. Also be careful not to wander off the trails. 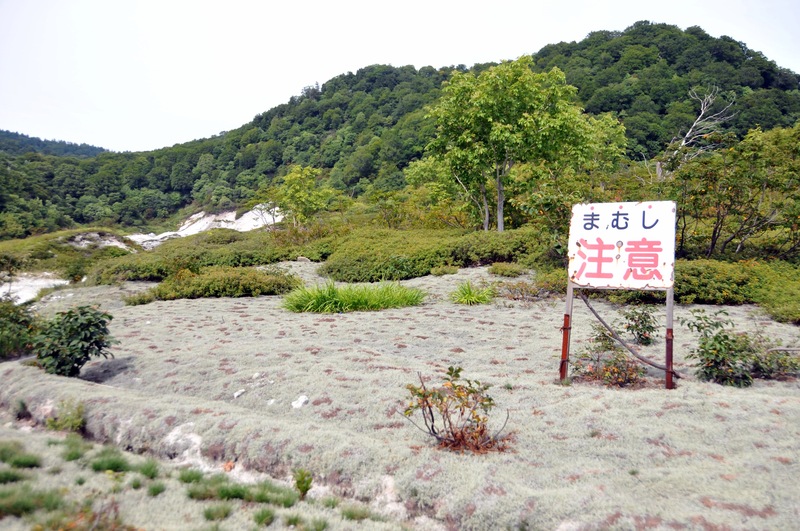 There are numerous signs warning of poisonous mamushi pit vipers! 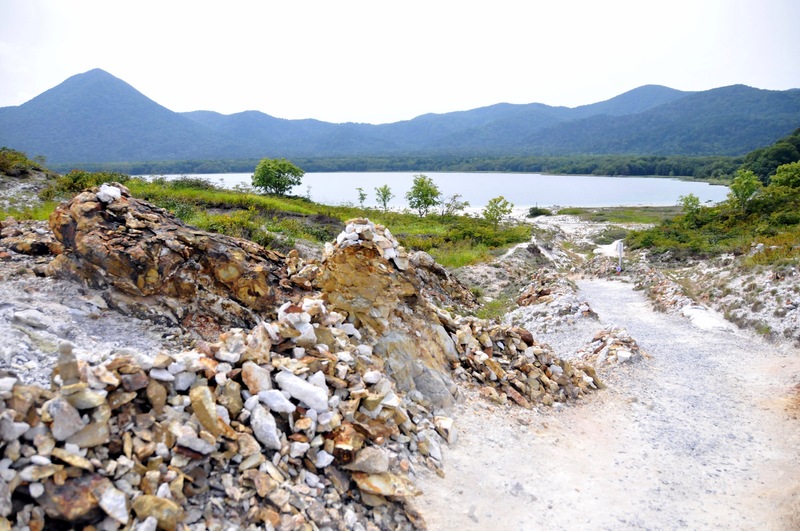 For more information, check out this excellent article by the Japan Times, ‘Osorezan – Mountain of Dread’. Your words and pictures do highlight how good Osorezan is to visit. I visited six weeks ago on a day trip from Aomori via train and bus. The trip itself was pretty good. The desolate volcanic landscape is amazing. For something different, I walked back down to Ohara on the coast. Wow – that is about a 15 kilometer walk. Was it scenic? Anywhere to stop along the way? Interesting. Not something I’d even thought about. It ends up being about 10 kilometres. Three good things, it’s all downhill and it is along an old forest road. And it follows a beautiful Gorge for the first 3 or so kilometres. One bad thing, I got attacked by big biting flies which wasn’t pleasant. I will post something eventually. And also suggest to the local Visitor Centre to mark the road on maps. It was an easy day trip.